The CHQ-SOM has been designed to allow a single relay output to be connected to the ESP loop. 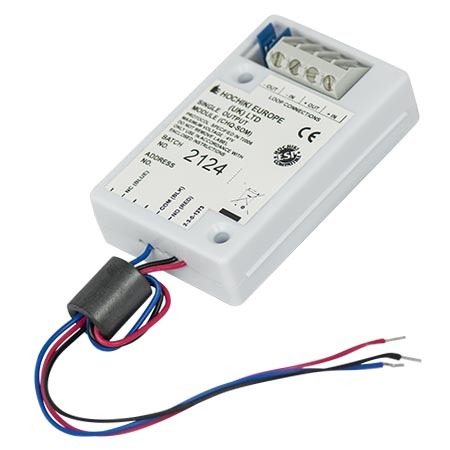 The unit incorporates a volt-free relay contact that can be configured as either N/O or N/C, the relay contact is rated to 30 V dc (max), 1 A (resistive load). The CHQ-SOM features three colourcoded flying leads, the unit also features a wiring terminal block for loop connection. To maintain LPCB approval the device must be mounted in an SMB-1 enclosure (or an equivalent enclosure made from polycarbonate or a similar material which is impact resistant as per EN54- 18:2005 Clause 5.9) in conjunction with the SMB-ADAPTOR plate, using two M3 screws or two M3 nuts and bolts. Enter your details and we'll occasionally send you special offers and product news. Discount Fire Supplies is a Limited Company Registered in Wales. Company Registration 7499137. VAT Registration Number 106 0586 39. * Free delivery is only valid for orders shipped to a United Kingdom Mainland address. ** Same day dispatch on all orders received before 2.30pm, if product is in stock.